Formax FD 8730HS High Security Shredder is the very best to come out of the Formax production house. It offers users with a versatile shredding unit that shreds both paper and various optical media, has level 7 NSA/CSS compliant security, and unmatched specifications in the market. Its paper shredding unit process up to 15 sheets in one go at a speed of 23 feet/min, while its parallel-running optical media unit shreds 2000 CDs per hour. 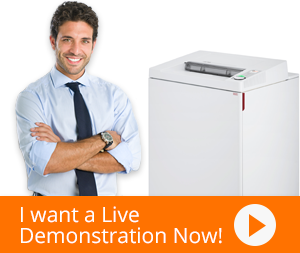 These qualities themselves are testament to this shredder’s superiority in its market. The FD 8730HS High Security Shredder has an intuitive LED control panel that brings every shredding function to users’ fingertips. Its auto stop/auto start features and automatic cleaning system are a big aid to operators, who need not perform everything manually. Jamming is an old problem with shredders. Formax FD 8730HS solves this issue with its auto reverse feature that automatically detects jams and de-jams stuck up material. Furthermore, it has various other safety and maintenance features that further improve user experience and uphold all professional values held by Formax. Its energy saving ECO mode, safety door sensor, EvenFlow Internal Auto Oiler and sizeable waste bins are just a few of the other perks user enjoy with the FD 8730HS.